Green Maxi Dress - you know you love it! Naturalizer Green Wedges - perfect for a tropical getaway. Tommy Bahama Set Sail Cologne - Umm! Green Calcite Ring - stunning! Green Goose Neck Arm Chair gorgeous sturdy chair with cherry wood base. Silk Palm Tree 4' tall. Daphne Silk Pillow - contemparary tropical. Palm Tree Giclee - easy way to create a tropical vibe. 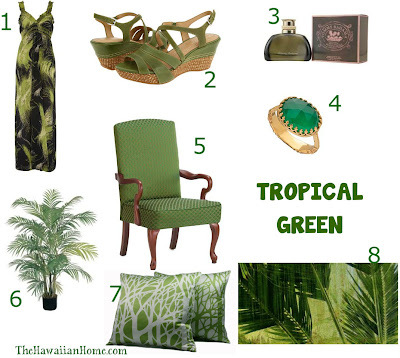 View more tropical green items at The Hawaiian Home.